I suppose it's a bit unorthodox to mirror the blog of one of your mates, but our friend Kevin Foakes has put the new artwork for his next LP online, and it's bloody gorgeous. 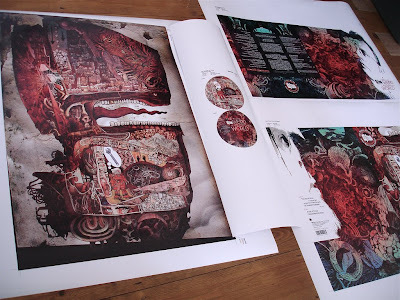 Henry Flint contributed the earthy, scratchy, detailed illustrations which caught my attention in the way little has since I discovered Vania Zouravliov, Aya Kato and Laurie Lipton. We can't wait for the album now! We're actually listening to tasters as I type. So you don't have to be dead then? The One That Got Away - one of many!